Thermal comfort in office spaces has been the topic of multiple research projects and studies in recent years. Read through to the end to learn interesting discoveries in this field, along with the magic recipe for improving thermal comfort! As per ASHRAE Standard 55, the Predicted Mean Vote (PMV) model can be used to predict the percentage of people dissatisfied with the thermal comfort in an office environment. The thermal comfort is considered a success if 80% of occupants are comfortable in their office environment. 20% of employees feeling thermal discomfort is a success? Is there a loss of productivity, and can we estimate the resulting cost? Independent studies have been conducted over the years by various scientists, labs and universities, all demonstrating the tangible impact of thermal comfort on productivity. Other factors must be considered when assessing thermal comfort, such as the velocity of diffused air when it reaches occupants, and each individual’s tolerance of heat and cold. 62% of workers state that when they are too hot, they take up to 25% longer than usual to complete a task. Cornell University found in a month-long study that when the office temperature increased from 68 to 77 degrees Fahrenheit, typing errors fell by 44 percent and typing output rose 150 percent. 150% output increase with 44% errors decrease = 216% Performance Improvement! The thermal comfort model that we use for temperature control was developed in the 1960s and based on the average 40-year-old male metabolism, overestimating female metabolism by up to 35% . An article published in 2015 in Nature Climate Change, Energy Consumption in Buildings and Female Thermal Demand, reminds us that the empirical thermal comfort model that we use for temperature control was developed in the 1960s and based on the average 40-year-old male metabolism. These numbers overestimate female metabolism by up to 35%, and that difference in metabolism is the primary reason women almost always feel colder than men. 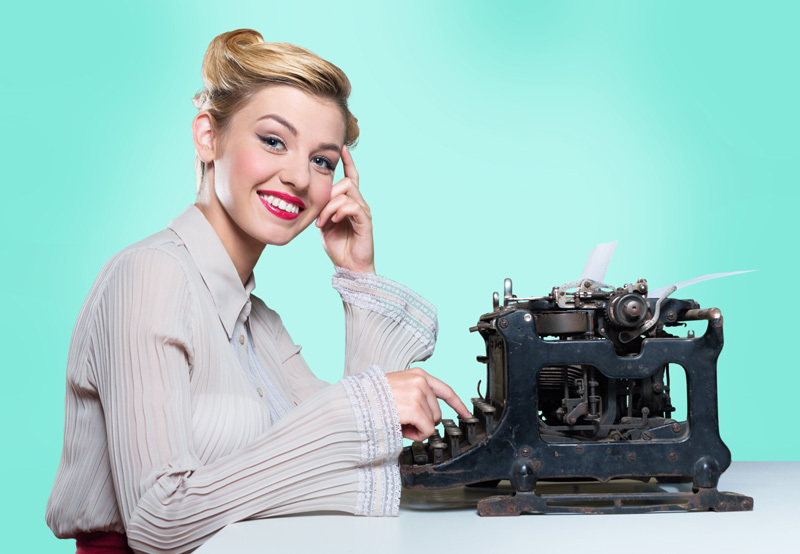 Many blogs and articles have been published since then calling air conditioning ‘sexist’! The truth is that metabolism varies with age, body fat and muscles, and is not just related to gender. Tolerance of heat and cold, as well as ideal temperature, varies for each individual and a one size fits all approach will never please everyone. As if it wasn’t enough, the average room temperature does not take into account other factors affecting specific locations in that room. The most common sources of temperature disruption are windows, heat-generating equipment and uneven air distribution creating air drafts and hot spots. What would a 10% productivity gain represent, even if it only affected 20% of your employees? A 2% overall productivity gain, yes. But let’s evaluate it with real numbers. If your office has 50 employees earning an average yearly salary of $50,000. Its total salary cost is $2,500,000 per year. A 2% overall productivity gain as a result of improved thermal comfort equals $50,000 per year. And we’re only considering reasonable thermal discomfort here. In more severe cases, employees may take sick days, and the employee turnover could increase dramatically. Add full days of work and the cost of hiring and training new employees into the equation, and that productivity number can quickly grow from 2% to much higher percentages. Is an 80% average comfort really the best solution? Can we improve it? How can we get some of that 20% back? 1. Global comfort: reach an optimal average temperature to please 80% of your employees. Achieve this the way you would normally do it: using temperature and ventilation control, zoning, etc. The REV diffuser gives you the ability to make local adjustments like no other ceiling diffuser can. You are now able to respond to the complaints of the remaining 20% without affecting the other employees surrounding that diffuser. Those who were comfortable will remain comfortable. 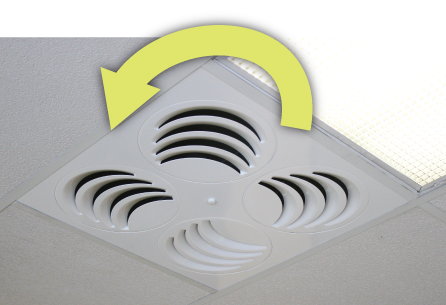 The REV diffuser is the only commercial ceiling diffuser which allows for a full 360 degree adjustment of the airflow. Its four round sectors can rotate independently to supply more or less air toward specific people and objects. The REV diffuser not only allows you to retain that extra $40,000 per year in extra productivity, it also lowers your operations and maintenance costs. How many complaints do you get per year? How much does it cost you to address each of these complaints? Use this tool to discover how much this upgrade can put back on your bottom line. Some investments just make sense, and the REV diffuser in office spaces is certainly one of them. Important note: The REV Diffuser is made specifically for the retrofit market. To design a new office building from the start, you may want to consider EffectiV HVAC’s PLAY Diffuser instead. The PLAY comes with a full metal plenum and certified performance data for engineering designs.